South Korea’s second largest automaker, Kia has been reported to have many major launches in the box. The company is to come up with few launches next year, which includes the launches of redesigned avatars of its famous Forte compact, K9/Quoris-based flagship sedan and even an all-new Rondo MPV. The company made the pictures of the redesigned-Forte compact and K9/Quoris-baseed flagship sedan’s official quite a while ago. But this time the automaker has come up with teaser images of the new Rondo, just in a way it did for the Carens. 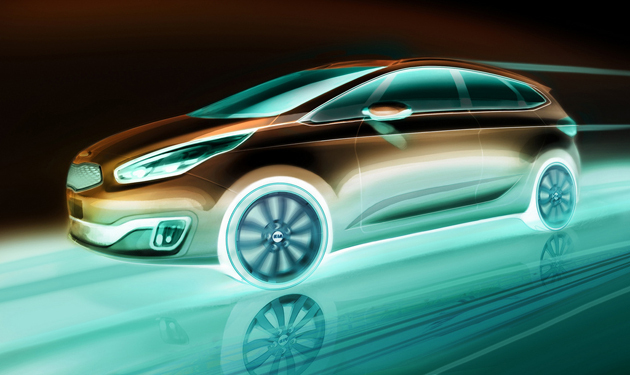 The Kia Carens will officially be debuted at the 2012 Paris Auto Show in Spetmeber. The car will probably go on sale early next year. Some time back, spy shots of the new Kia Ronda made headlines about it being much sleeker than the one, which was dropped in the US at the end of 2010. Now when the images of the new Ronda went official, it has certainly been confirmed that Kia is all set to hit back in the US car market. Like Kia’s most of the new ranges, it’s again the Chief Design Officer of Kia Motors, Peter Schreyer, who is the father of Carens and the new Ronda too. As per the official images, Ronda will be featuring a sporty cab-forward design with a low roofline and large wheels. Although the Korean automaker didn’t reveal any information about the car, but it’s being highly anticipated that Ronda’s platform would be the same as the platform of the Kia C’eed hatchback and upcoming 2014 Forte. Under the hood, the European avatar might feature a 1.7L turbo-diesel and a 2.0L turbo four powerhouse. The former engine has a capability of churning out a power of 115hp and a torque of 188lb-ft, while tha latter engine can deliver a peak power of 136hp and a torque of 236lb-ft.